Hofstra Student Life: Discovery Program 2015! "Discover Your Path"
Discovery Program 2015! "Discover Your Path"
Hello! My name is Wendy Markert and I am the Discovery Program Coordinator. I am a Discovery Program graduate from the Outdoor Exploration Path, and I would not be where I am today without this program. The Hofstra Discovery Program has four different paths to choose from, Community Empowerment, Social Awareness, Outdoor Exploration and, our newest path, Leadership. Although Hofstra was close to home, I did not know anyone here and I was nervous about making friends. The Discovery Program really helped me to find and expand my boundaries, helping me to make friend easier and overall making the transition from high school life to college life less stressful. 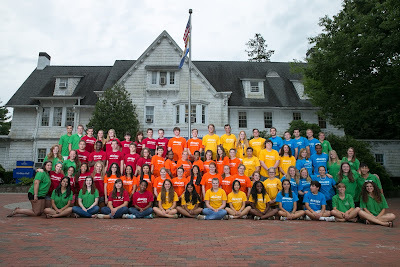 The Discovery Program takes place from August 23rd to August 27th this year and during my experience with the program I created great friendships with the other students that I know will last for many years to come. I recommend this program to any and every student, so don't forget to apply today! If you have any questions about the Discovery Program I would be more than happy to answer them!